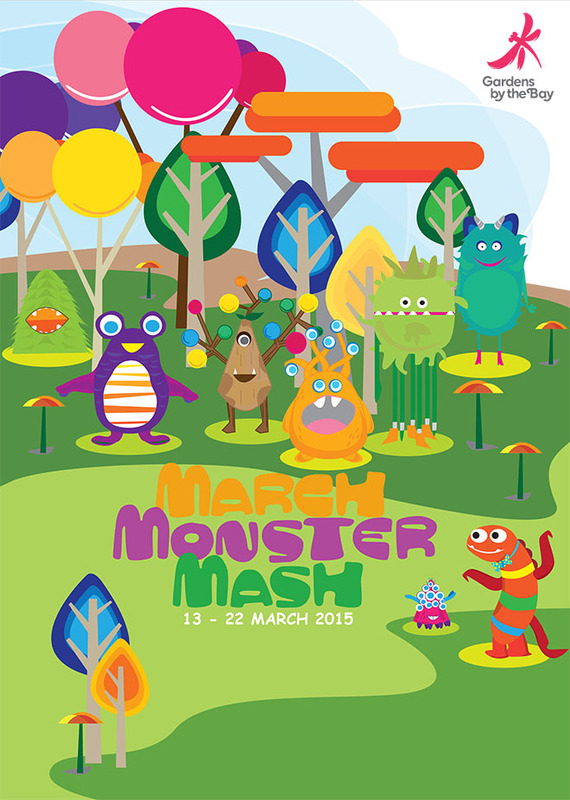 This March, join us for heaps of ‘monstrous’ fun! Have a roaring good time with puppet shows, craft activities, monster installations, workshops, a movie screening, a monster parade, and lots more! Come by in your best monstrous self and be part of this festival! Lay out your picnic mat and enjoy a movie screening of “Where the Wild Things Are”, an adaptation of the classic children’s story from Maurice Sendak. Check out monstrous installations at various locations in Gardens by the Bay! Decorate a blank canvas at The Canopy, or take a self-guided trail through the various monster installations around the Gardens. Googly eyes? A pair of large feet in your favourite colour? Get all these at the monster craft booths! Singapore Memory Project: Awesome Memories! Share your awesome memories with the rest of Singapore, and take home a special set of storybooks by local children’s books writer, Adeline Foo. Transform into a funny, scary, quirky or cute monster at our face painting booths, or get a balloon animal to take home with you after your adventures in the Gardens! Try our free game booths at the Far East Organization Children’s Garden. Have you ever dreamt of hosting a wild monster-themed party like one out of a storybook, but didn’t know how? Here’s your chance! Learn everything you need to know at this hands-on workshop, from how to prepare themed snacks, and dressing up your living room, to organising monster-themed activities. Please register your interesthere by 9 Mar 2015. Monsters of all shapes and sizes are coming to delight you from every corner whichever way you turn! Come along to the Children’s Garden Amphitheatre and you’ll be surprised by colourful monsters, delightful performers, as well as catchy songs woven into a terrific Monster Tale. An entertaining and enchanting performance for the little ones and all in the family! Interactive Storytelling: I’m A Fine Storyteller And So Are You! This storytelling session will bring out the storyteller in you! Spin a monster tale or two, why don’t you! How this story develops and how it ends is entirely dependent on you and your brilliant imagination. You’ll jump in and learn to improvise – moving the story in unexpected turns. Are you ready for an epic show? If you have a wicked sense of adventure, a terribly brave heart, get ready to have fun! On the first Sunday, join a local celebrity on a tour of the monster installations and partake in our interactive storytelling session! On the second Saturday, sign up for our Make A Monster Workshop, co-hosted by a celebrity mom. Organised by the National Library Board, join our interactive storytelling sessions and create new stories each time with our storytellers. Bounce to your heart’s content in a giant inflatable playground at the Supertree Grove. A baby fish is born – but he’s terribly monstrous-looking! The ‘little monster’ makes its way, at first all by his lonesome self, and then encountering the monstrous elements in the water. Watch how the little ‘monster’ turns into quite a little hero and shows everyone how life has a way of turning things around. Take in an empowering tale and meet creatures of all kinds splashing about in the water! And hey, you can join in too! Give the whole family a monstrous make-over in this costume-making workshop! Join us for a wild rumpus around the Supertree Grove for some inspiration then learn how to turn simple household objects and recyclables into awesome monster costumes for the whole family! Please register your interest here by 9 Mar 2015. Want to join in a Monster Parade? We bet you would! Come dressed up as a Monster Family and join in the mass songs and dances! And if you survive the crazy fun, you might just win an award for being the best-dressed Monster Family! For some instant Monster accessories, come on down to our Monster Craft booth, or if you are up to the challenge, sign up for the “Make Me a Monster Workshop”. Our friendly folks will help you whip up DIY costumes for you and your family. Pack your picnic baskets and relax with us at The Meadow for an evening with the Singapore Symphony Orchestra. As part of SPH’s Gift of Music series, join Associate Conductor Jason Lai and the SSO as they present a selection of music rooted in love and fantasy at Gardens by the Bay. Tchaikovsky’s Swan Lake is instantly recognisable while the composer’s Sleeping Beauty Suite will appeal to younger audiences. Prokofiev’s Romeo and Juliet Suite remains one of the best-known musical interpretations of Shakespeare’s tragic love story, while Stravinsky’s The Firebird marked the composer’s breakthrough to become one of the most influential composers of the 20th century.